In practical terms, the task of determining the proper height for a depth jump centers on the athlete’s ability to achieve maximal elevation of the body’s center of gravity after performing a depth jump. When implementing plyometric training to enhance performance in youth, the suggested approach is to integrate resistance, plyometric, and speed training into a progressive conditioning program in which the volume and intensity of training periodically change throughout the year. One of the basic tenets of all exercise programs is that major efforts of training should be preceded by lower-level activities. Using the latest research, top trainer Donald Chu presents the best methods, strength and power exercises, workouts, and programs for optimizing athletes’ performance. Sport-specific plans can be easily integrated into a comprehensive training program. Injury prevention and rehab protocols reduce time on the sidelines. Strength and power—which provide the ability to move quickly with great force—are absolute necessities for today's athletes. Elite players, coaches, and trainers rely on plyometrics to improve quickness, speed, jumping ability, footwork, body control, balance, and overall performance. With this authoritative guide on plyometrics, you can, too. 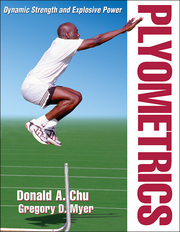 In Plyometrics, Donald Chu and Gregory Myer present only the best science-based and tested drills, exercises, and programs to ensure optimal performance results for every athlete at any level in any sport. You'll also find the latest research, application, and recommendations for the prevention, screening, and rehabilitation of injuries as well as targeted training for young athletes and female athletes. Plyometrics provides instruction on assessment, selection, and sequencing of exercises for building the ideal program based on individual needs and goals. You'll also find nine sport-specific training regimens, including basketball, soccer, football, rugby, volleyball, and mixed martial arts. With comprehensive coverage and expert insights, Chu and Myer take the guesswork out of training and provide the best tool for achieving dynamic strength and explosive power. It is the ultimate resource for maximizing athletic performance. Dr. Donald Chu, PhDPT, ATC, CSCS, FNSCA, is a professor emeritus of kinesiology and physical education at California State University at Hayward, where he taught for more than 20 years. He is director and founder of Athercare Fitness & Rehabilitation in the San Francisco Bay area, which specializes in sport performance training, fitness programs, physical therapy, and clinical psychology. Dr. Chu holds certifications as an athletic trainer (ATC) from the National Athletic Trainers’ Association (NATA) and as a certified strength and conditioning specialist (CSCS) from the National Strength and Conditioning Association (NSCA). He has served on the board of directors for both organizations and is a past president of the NSCA. He resides in Alameda, California. Gregory D. Myer, PhD, FACSM, CSCS,*D, is currently the director of research and the Human Performance Laboratory for the Division of Sports Medicine at Cincinnati Children's Hospital Medical Center and is also serving as the senior research advisor to the Micheli Center for Sports Injury Prevention. He also maintains his primary faculty appointment in the departments of pediatrics and orthopaedic surgery in the College of Medicine at the University of Cincinnati and secondary appointments in the athletic training division at Ohio State University. He is a member, lecturer, and honoree of the ACSM, NSCA, and NATA for his breakthrough research, including his defining work on the development of prevention strategies in knee injury. Myer’s work in the Human Performance Laboratory allows him to integrate the most advanced research findings into training protocols for athletic development and injury prevention. Dr. Myer works with athletes from preadolescence to professional level and speaks to coaches around the world seeking to update their own training programs. Dr. Myer is the author of Strength and Jump Training for Volleyball and several book chapters related to his research on the biomechanics of sport performance and training for injury prevention. He has also authored over 150 articles in peer-reviewed medical journals. He resides in Cincinnati, Ohio. "This is the definitive guide for designing plyometric programs for individuals with different needs, goals, and abilities. From injury prevention to rehabilitation, this book is exceptional." "Don Chu and excellence in plyometric training are synonymous."